DanceSport World! | All about Dance Sport, Ballroom and Latin Dancing! Portdance just release their new two models of unisex dance shoes with sneaker sole. They were previously thought to be woman dance shoes, however their style got a bit welcome also from the male community. Portdance PD03 Fashion – Black Leather & Neoprene Lycra. Portdance PD06 Fashion – Silver and Black Leather. This dance shoes are design and made in Portugal and offer a great quality for price. Just click on the image to go directly to our webstore. Ath the time of this post we are selling them for €82,90. Hope you like them so much as we do! 1. Dance is hard. – No ballroom dancer ever became successful riding on their natural born talents only. Dancers are artists and athletes. The world of dance today is akin to an extreme sport. Natural ability and talent will only get us so far. Ballroom Dancers must work hard and persevere. Dancers give years of their lives plus their sweat, tears and sometimes blood to have the honor and pleasure of performing on the best competitions and stages. 2. You won’t always get what you want. – We don’t always get the place we wanted, do it perfectly well when we want, hear the compliments we want, make the money we want, won a national competition as quick as we want, etc, etc. This teaches us humility and respect for the process, the art form and the masters we have chosen to teach us. The faster we accept this, the faster we can get on with being brilliant. We’ll never be 100% sure it will work, but we can always be 100% sure doing nothing won’t work. 3. There’s a lot you don’t know. – There is always more a dancer can learn. Even our least favorite teachers, choreographers and directors can teach us something. The minute we think we know it all, we stop being a valuable asset. 4. There may not be a tomorrow. – A dancer never knows when their dance career will suddenly vanish: career ending injury, car accident, death…Dance every day as if it is the final performance. Don’t save the joy of dance for the dance floor. Infuse even your routine classroom exercises with passion! 5. There’s a lot you can’t control. – You can’t control who likes your work, who doesn’t, the politics of a dance competition, etc. Don’t waste your talent and energy worrying about things you can’t control. Focus on honing your craft, being the best dancer you can be. Keep an open mind and a positive attitude. 6. Information is not true knowledge. – Knowledge comes from experience. You can discuss a task a hundred times, go to 1000 classes, but unless we get out there and perform we will only have a philosophical understanding of dance. Find opportunities to get on dance florr. You must experience performance firsthand to call yourself a professional dancer. 7. If you want to be successful, prove you are valuable. – The fastest way to loose a partner is to prove to your partner he/she doesn’t need you. Instead, be indispensable. Show up early, know your material, be prepared, talk to your partner, set goals and above all be willing to work hard. 8. Someone else will always have more than you/be better than you. – Whether it’s charisma, talent, energy, money, better teachers, great sponsors or trophies, it does not matter. Rather than get caught up in the drama about what others are doing around you, focus on the things you are good at, the things you need to work on and the things that make you happiest as a dancer. 9. You can’t change the past. – Everyone has a past. Everyone has made mistakes, and everyone has glorious moments they want to savor. “Would you keep a chive in your tooth just because you enjoyed last night’s potato?” Boston Common TV Series. Dance is an art form that forces us to concentrate on the present. To be a master at dance we have be in the moment; the minute the mind wanders, injuries happen. If they do, see #12. 10. The only person who can make you happy is you. – Dancing in and of itself cannot make us happy. The root of our happiness comes from our relationship with ourselves, not from how much money we make, what part we were given, what company we dance for, or how many competitions we won. Sure these things can have effects on our mood, but in the long run it’s who we are on the inside that makes us happy. 11. There will always be people who don’t like you. – Dancers are on public display when they perform and especially in this internet world, critics abound. You can’t be everything to everyone. No matter what you do, there will always be someone who thinks differently. So concentrate on doing what you know in your heart is right. What others think and say about you isn’t all that important. What is important is how you feel about yourself. 12.Sometimes you will fail. – Sometimes, despite our best efforts, following the best advice, being in the right place at the right time, we still fail. Failure is a part of life. Failure can be the catalyst to some of our greatest growth and learning experiences. If we never failed, we would never value our successes. Be willing to fail. When it happens to you (because it will happen to you), embrace the lesson that comes with the failure. 13. Sometimes you will have to work for free. – Every professional dancer has at one time or another had to work without pay. If you are asked to work for free, be sure that you are really ok with it. There are many good reasons to work for free, and there are just as many reasons not to work for free. Ask yourself if the cause is worthy, if the experience is worth it, if it will bring you joy. Go into the situation fully aware of the financial agreement and don’t expect a hand out later. 14. Repetition is good. Doing the same thing over and over expecting a different result is insane. – If you keep doing what you’re doing, you’ll keep getting what you’re getting. If you keep doing the bare minimum of required classes, don’t complain to your teacher when you don’t move up to the next level. If you only give the bare minimum in your company, be happy staying in the corps. If you want to grow beyond your comfort zone, you must push yourself beyond your self-imposed limitations. 15. You will never feel 100% ready. – Nobody ever feels 100% ready when an opportunity arises. Dancers have to be willing to take risks. From letting go of the ballet barre to balance, to moving around the world to dance with a new company, from trusting a new partner to trying a new form of dance, dancers must have a flexible mind and attitude as well as body. The greatest opportunities in life force us to grow beyond our comfort zones, which means you won’t feel totally comfortable or ready for it. Found via Credit towards Melanie Doskocil on her blog, Ballet Pages. 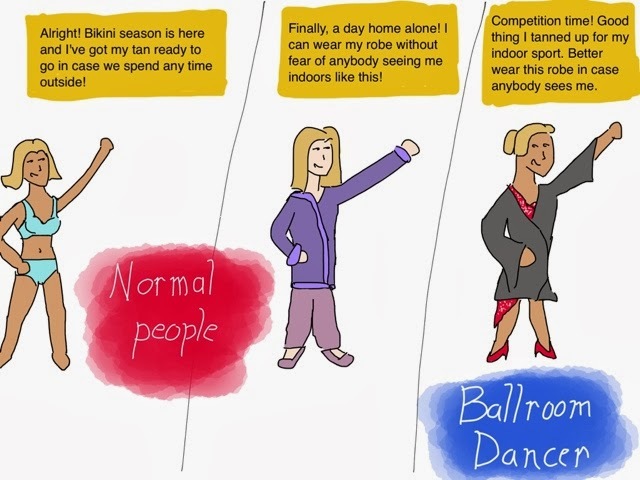 Tottally applied to Ballroom and Latin dancers. Thanks Michelle for bringing it to our attention! Dancers, any thoughts? Teachers, any other points you would add? In Ballroom Dancing, improving your dancing skills after you’ve been a beginner for a time requires increased dedication and a willingness to try new skills that will push you beyond beginner boundaries. Here you will find some tips to become a better Ballroom and Latin Dancer. Practice makes perfect. This is basic… Of course, no one is perfect, but everything can be improved. Practicing can definitely improve your technique, steps, confidence, etc. But attention. The way you practice is very important on your future success. Practice clever is better that practice 25 hours a day. Stretching and Warm Up can improve your flexibility as well as your dancing. The more stretched you are, the better your lines will look, and your steps, etc. Stretching can also help prevent injuries. Even small stretches like jumping-jacks or stretching in the running position helps stretch out your hips for more flexibility. 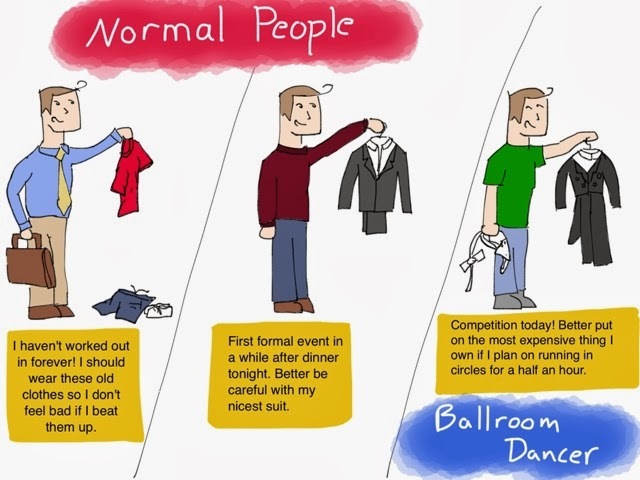 You want to do your best on the the dance floor, so don’t forget to warm up correctly all the times. A good diet (not one of the ones you go on to lose weight!) can make you a better dancer. The better you eat, the better you are. If you dance you are doing a body exercise. So you will for sure need more nutrition then a “normal” person. Pay attention to your blood levels, and take supplements if you need it. 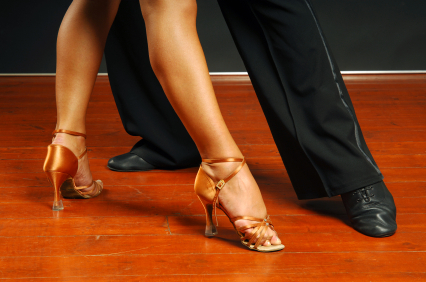 Exercising can help you be a better ballroom anda latin dancer, too. Crunches can make it easier to keep your balance on turns and steps that you have to hold. Push up makes your posture and your shoulders look much better. Whatever your choice of dance, ballet is the foundation of all dance. It can help improve your technique and your posture. Even if you don’t do ballet or not interested. Just dance for fun. You need to practice, you need to eat well, but you also need to rest. If your body is not rested enough your practice will be waisted. A good night of rest is very important to your success as Ballroom and Latin Dancer. Don’t forget also to rest your head. At least one day a week take one day off to do different things, not related to dance.